Dorothy Carter was fiercely independent. But she never had a driver’s license and never drove a car. For all 94 years of her life, she took public transportation. “It was her way to stay independent. To do what she wanted to do, when she wanted to do it and not be bound by anybody’s schedule or feel like she was imposing,” said Dorothy’s son, William Carter III. On Thursday, Sept. 28, William took his mother Dorothy on one final ride to celebrate her life and the independence transit afforded her. “I’m just riding all day. We’re taking a farewell tour,” said William as he boarded a westbound Green Line train at Snelling Avenue Station. “It’s been quite a ride for her,” William said. 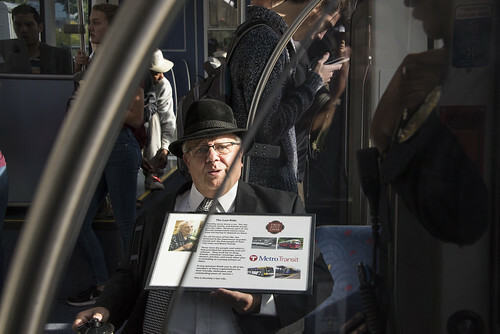 With a sign and an urn containing Dorothy’s remains in tow, William boarded several bus routes, the METRO Green Line and the A Line to visit some of his mother’s regular destinations throughout the day. “Walgreen’s on Snelling. Rosedale Mall. Korte’s. We might stop by Plums for some French onion soup that she liked. I plan on stopping by her doctor’s office, too,” he said. A resident of the Highland Park neighborhood, Dorothy knew the St. Paul bus routes like the back of her hand. Macy’s in downtown St. Paul was a favorite destination prior to its closing. But she would also take transit across town on occasion. She once took transit from St. Paul to Southdale in Edina to accompany a visually impaired friend (who also did not drive) for a doctor’s appointment. As a longtime Twin Cities resident, Dorothy always intentionally chose to live near access to transit, and she witnessed firsthand the vast changes in public transportation from the streetcar days to the opening of the METRO Green Line. In recent years, when Dorothy was no longer able to take transit on her own, she started using Metro Mobility to get to doctor’s appointments, lunches with friends and shopping, up until a few months before she died. She instilled that appreciative attitude and her belief in the importance of transit in her son, an only child. “She taught me how to sew. How to iron. And how to take the bus,” William said. By the time William was in the fourth grade, Dorothy would send him on the bus on his own to start learning the routes. A champion of Metro Transit’s efforts to bring rapid bus service to the region has been recognized as one of the transit industry’s top young professionals. Arterial BRT Manager Katie Roth is among those recognized in Mass Transit magazine’s 2017 Top 40 Under 40 list. The list recognizes professionals who have made “significant contributions” to the transit industry. “Out of more than 160 nominations, these chosen professionals have proven records of accomplishments, making a difference at their companies or transit agencies, in their communities and in the industry,” said Leah Harnack, Mass Transit’s Executive Editor. As a manager in Metro Transit’s Bus Rapid Transit/Small Starts Project Office, Roth, 32, leads a team of planners, engineers, consultants and outreach staff planning future rapid bus lines. She also helps coordinate across divisions to introduce the new service. The region’s first rapid bus line, the A Line, opened in 2016 with faster, more frequent service on Snelling Avenue, Ford Parkway and 46th Street. Planning is now underway for the C Line, which will largely replace existing Route 19 local service in 2019. Roth’s career at Metro Transit began as in intern in Service Development in 2006. As a Senior Transit Planner at SRF Consulting Group, shehelped complete a study of a regional rapid bus network that would cover 100 miles and see an estimated 160,000 average weekday boardings. She rejoined Metro Transit in 2012. Roth has also presented at several local and national conferences and been active in WTS Minnesota, a group that supports women in the transportation industry. Several Metro Transit employees have been named to Mass Transit’s Top 40 Under 40 list since it was initiated a decade ago. Past honorees include Assistant Transportation Manager Chang Yang, Kristin Thompson, Assistant Director-Scheduling, Analysis and Data Collection, Capt. Jim Franklin and Charles Carlson, a Senior Manager in the Bus Rapid Transit/Small Starts Project Office.